Helena has made it to the Northern Hemisphere! Rolf, Bart and Magda left anchorage at Ascension Island on March 28th and, after a pleasant trip with much better winds then expected, arrived in Dakar, Senegal on April 8th. 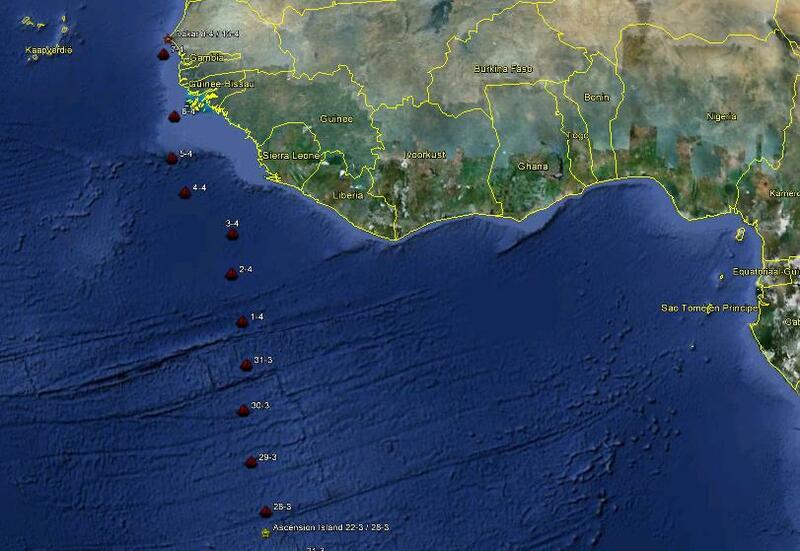 They’ll stay there for a few days to refuel and resupply and wait (hope) for good winds to the Canaries. Below you’ll find the daily updates of their trip. It was a beautiful day today with calm seas, so we have managed to make some good miles again. The wind has just picked up again about one hour ago and we’re back to the struggling against the waves now. We hope to arrive in Dakar tomorrow at the end of the day. We should also have mobile phone coverage by then, so we will not be sending an update tomorrow. Instead, we’ll just call! Last night we had an extraordinary event around the ship. Most if you may be familiar with the phosphorescent ability of some algae and plankton. Last night after sunset, the ocean was covered in a big layer of phosphorescent algae which were lighting up the ocean surface in the most spectacular way. The bow wave of Helena was creating a beautiful array of lines which were lighting up continuously and the waves could easily be identified by the phosphorescent crests. We were creating a long trace through the ocean of phosphorescence by the propeller and the displacement of the ship which was several hundred meters long! To top this up, we were visited during the night by a small pod of dolphins, which were completely invisible to the eye. However, the traces through the water were lighting up as tunnels in the ocean while they were playing with the ship. This light show of synchronised swimming was one of the most spectacular things that can ever be seen on the ocean. This description I’m giving does not do it justice in any possible way. We have sailed today! Well, motorsailing, but still, we have been sailing since this morning and are still doing so! The wind is slightly more westerly and since we had a pretty good position, we had enough room to deviate towards the east and do some close hauled sailing with the engine to help us get through the rough waves. The sea has calmed down a lot by now and the wind has gone down a bit as well, but at least we have made some good miles today. We expect to be motoring through the night again to make way back towards the west again to stay clear of the coastline of Guinea Bissau and Senegal. There are quite a few shallow areas in front of the coast which we prefer to avoid. The visibility is a bit poor in this area and we have found out that the masts and all the lines, even the fishing rod, are currently red in colour. It turns out that the sky is loaded with fine red dust from the sahara which covers everything on board. We’re sneezing a bit more now as well, which is probably due to this same dust. We have about 250 miles to go to Dakar so everything is looking good for an arrival on Monday. It is another noisy motoring day on Helena. The wind has finally calmed down this afternoon and after heaving-to for lunch we continued steadily towards Dakar. It looks like we will be arriving there on monday. Today we have been looking more closely at the strategy after dakar. We expect some strong winds (about 20 knots) all the way to the canaries, but completely from the wrong direction. Therefore it will be important to have a good strategy for our sailing course since the seas will be pretty big with that as well. No final results yet, but that should become more clear by the time we leave Dakar again. We are also in a busier traffic area with lots of ships travelling along a similar course. We hear lots of traffic on the radio and occasionally one of them has to change course to let us follow our course. It is quite nice to see that these large vessels give us right of way most of the times. Tonight Marga is making the polish style meatballs and we’re looking at another few days of motoring before our arrival in Dakar. It looks like we have cleared the doldrums. During the night we closed off the doldrums with lots of high (and harmless) lightning and many squalls. Today the wind has picked up, although from the exact opposite direction from us. Therefore we have spent the day beating against the wind and waves. The wind has lost a bit of force by now and we hope to be motoring a bit calmer throughout the night. Sleeping is getting more difficult now with the beating, rockin’ and rolling so we’re all getting a bit more tired now. This afternoon we spent filling up the main fueltank by transferring our fuel from the drums on deck to the main tank, so everything is now topped up again for the next couple of days towards Dakar. Doldrums weather everywhere around us today. We’ve actually done a bit of sailing for one hour on the winds that were associated with a large squall which we passes through. Right now the sea is confused because of all the different winds around us. No swimming today and we’re doing our best to keep everything dry. Today (since about 2 hours) we have a little bit of wind again, just enough to let the mainsail and mizzen help out a tiny little bit. We have also run into the equatorial counter current which flows in a south easterly direction in this area, so this means that we will be slowing down a bit for the rest of this leg. There are numerous squalls around, but so far we have been very lucky and (almost) nothing has passed directly over us. These squalls also bring a lot of lightning, but so far, none of this lightning activity actually touches down onto the ocean. The evening sky is therefore transferred into a spectacular array of fireworks which light up the highest parts of the clouds without posing any serious threat. The temperatures are very high and around 37 degrees C so it gets very very hot with so little wind so this afternoon we had another mid-ocean swim to cool down. For the rest the sea is quite calm and we’ve got nothing better to do than wait for the weather to cool down a bit again. We’ve made it across the equator, sailing! This morning at around 7 we passed the equator. After crossing the equator, we ran out of wind around noon so we have been running on engine ever since. We celebrated our crossing today. We had a beautiful lunch by Marga, consisting of the fish she had shot under the ship at Ascension, prepared with lots of nice stuff and accompanied by a nice bottle of champagne. Since we had some squalls around us, we delayed the equatorial swim until this afternoon and for a few minutes, Helena was turned into a ghost ship since there was nobody on board anymore! Tonight we are finishing up the celebrations with pancakes and movie night. We are very very lucky. We’re still sailing in the doldrums! We expected to be motoring since yesterday, but we’re still sailing right now! The wind is slowly dying out though, but nevertheless, we have gained a lot of miles which we will not have to burn diesel for now. Poisson Cru was great and tonight carbonara. The wind is still here and we’re enjoying every minute of it before “the machine who may not be named” has to be started. Hopefully we’ll get a better radio connection after the Equator, so we can be more thorough on our updates. Short message again since the connection is getting worse. We’ve had some nice winds today and we’re hoping for them to last us until at least tomorrow. We’re back in the passage routines and we are enjoying the breeze while it lasts. We have got some fish in the freezer by now, one small mackerel which we caught on the way in to Ascension, two which we shot with the spear gun around the boat and a lovely piece of tuna which we got from another yacht that came into Ascension. Tonight we’ll start eating this tuna as the french Polynesian dish poisson cru. We are underway again. We did not get our satphone fixed, but we have spent a lot of time with green turtles, their hatchlings, lots of fish and some very pleasant people working on the island! We have decided to set course to Dakar instead of the Cape Verdes. Doing this means that we can still divert to the Cape Verdes if we want to, but will also put us a little bit further east which is of benefit for the very last leg to the Canary Islands. The downside is that we will have approximately 1000 miles of motoring to do to get across the doldrums which is the widest on the eastern side. We left the anchorage at 1500 today and we’ll try and send updates again every day, unless the connection is too bad. Omg i`m sooo jealous when , seeing feeling all of your journey tales.Thanks for sharing. Maybe one day……. Have a safe trip to Dakar!